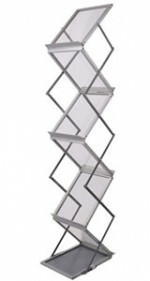 We have a wide range of great value literature and leaflet stands, available in a variety of sizes and styles. 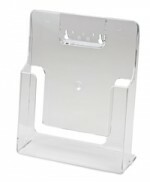 All of our literature stands come with a free carry case, making them easy to transport. Our literature and leaflet stands compliment a stand, enabling you to display your literature in an orderly manner. When selecting your literature stand you should consider the following elements: style, number of pockets, size of pockets and orientation of your leaflets. 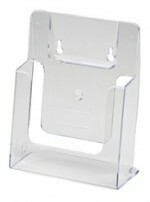 If you have limited space, the stand alone clear acrylic literature holder available in sizes A4, A5 and DL is ideal. 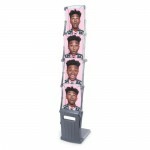 This literature holder has two options for display and can be either placed freestanding on any flat surface, or can be mounted to walls using the pre-drilled holes. 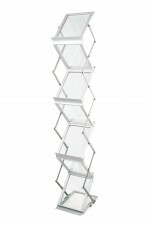 With its small footprint, this display is a perfect way of displaying leaflets and brochures. Customers have used it within table top displays, counters, till areas, reception areas, waiting rooms and museum exhibits. You may have multiple items of literature or want to create an impact repeating the same literature in different pockets, which helps if you have a busy exhibition or event stand. Consider the number of pockets that would be right for you. 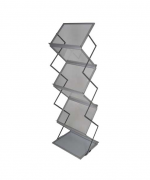 We stock literature racks with between 4 to 7 pockets in different materials to suit your aesthetic needs and budget. If you are on a budget but still need multiple pockets to display your literature then our Rocket fabric literature stands are perfect. Your literature can be inserted into the fabric pocket to keep them organised. These are available with 4 pockets and are one sided. Our folding literature stands have the added benefit of being double sided with racks on each side to display literature. These are available with either 6 to 7 pockets. Assembly of literature stands will depend on the materials used but all are very simple. 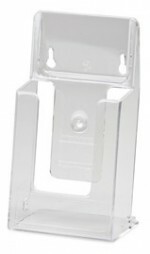 Acrylic and metal stands are assembled by gently pulling the concertina to fully unfold the display and secure in place. Fabric literature displays are assembled by rolling out the fabric pocket and attaching the bottom of the display to the support foot. The tension pole then pops into the back of the support foot and is secured in place at the top of the fabric stand to complete your literature stand.